We bought this item 3 years ago. It still function like new and there are no problems with the item ( doors open and close well). Still looks good. 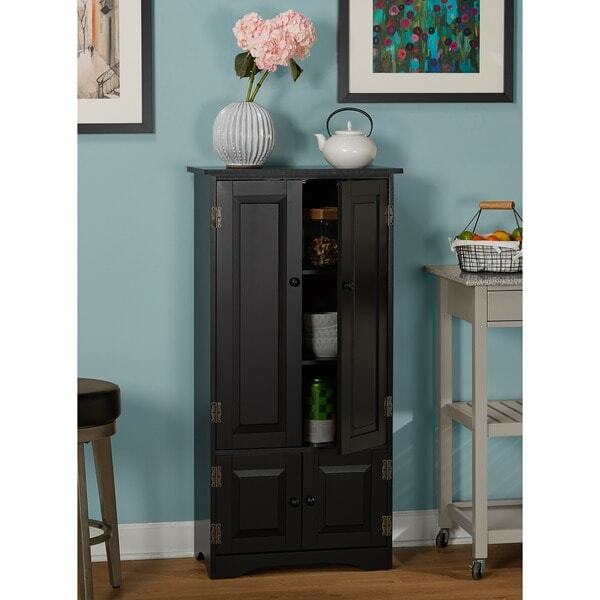 Elegance meets practicality in your home with this tall country buffet cabinet from Simple Living. Built with country decor as its theme, its antique finish makes this traditional buffet cabinet a stylish addition to your home. This cabinet is a versatile solution for a narrow kitchen or pantry that needs flexible storage space. The actual color is much lighter than pictured, at first I thought it was unfinished. The wood is pretty soft, be careful when assembling not to screw hardware in too tightly. Have a power drill ready, you'll need it to attach the back piece since there are no pre-drilled holes there. My shipment must have come straight from the factory since the wood was so freshly cut the smell was almost overpowering. I washed inside and out with Murphy's Oil Soap, let it dry all day, then applied lemon oil. Much better. cabinet arrived really fast,everything in tack,the only drawback are the knobs,the holes in them are drilled to large for the screws they provide i used thicker ones and the knobs are secure and not coming off every time you opened the door. Pay close attention to the size.\! It's a cute little cabinet - LITTLE is the most important word. Although I did look at the sizes listed on the site and they were accuarate, I don't think I realized how smaill it would actually be. if you have a small space, I highly recommend it. You will need a power drill for the doors as the pre drilled holes either do not line up properly or don't exist at all. It took several hours to put it together. Easy to put together. Very cheap looking and the doors are uneven and the bottom compartment doors do not open all the way. This cabinet is exactly what we needed for our kitchen! 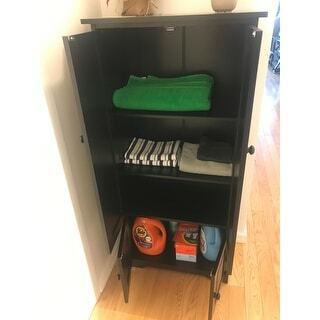 It fits perfectly in the space we have and hides so many small items that you don't want to be seen all the time but need to be handy when they are needed. Eash to assemble if you just follow the directions. I like the size of this item but it is not as sturdy as I had hoped. However I would recommend it. The finish is nice. Looks elegant and fits perfectly in my kitchen. Very cute little cabinet. Not overly complicated to assemble and managed to survive two moves without any kind of issues. We use it as added pantry space and as a microwave stand. beautiful cabinet & easy to assemble. Its ok. The hardware is visible on the outside and I purchased the white and you can see all the screws etc. 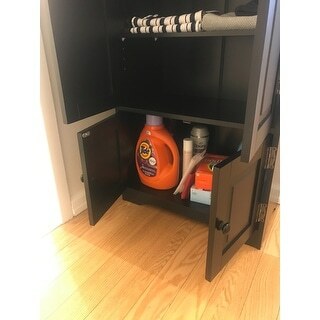 I used this as a bathroom storage cabinet and bottles would scratch up the shelves easily and if the towels don't fit perfectly the 2 doors wont stay closed as they close with magnets. You get what you pay for...it is inexpensive and a nice size and it lasted me over a year...now its for storage in the garage. Purchased this to use as a wine/liquor cabinet which worked pretty well for about 2 years. Over time the magnetic doors seem to not work as well, but it still looks fairly new from an aesthetic point. For extra kitchen storage, or books, etc, it's a good purchase. Great cannot for the price! This is just what I needed to store items in my kitchen. It uses very little space and it provides me with the additional pantry space and the multiple shelves are an added bonus. "What is the height of the bottom section? I have a cooker I would like to hide but have to make sure it would fit"
I will measure when I'm where this cabinet is located. Sorry I'm not with this cabinet. It’s approximately 8” but not deep. The cabinet is great in my bathroom (there’s no medicine chest so I use this instead) ...but I don’t think you could use it effectively to hold things like dishes or kitchen appliances. The height is right at 12 inches, the depth (front to back) is about 10 inches. There is no center divider. "What is the inside depth of the adjustable shelves? I need it to accommodate 10 1/2" china plates. Also, what is the weight limit of the adjustable shelves?" The inside depth of the adjustable shelves is 11". I'm not sure of the weight limit of the shelves, but I keep files of important documents on mine. I'm sure it would hold china plates just fine, as long as the adjustable hooks don't move. It seems that the depth of the shelf is right at 10.5 inches. I wasn't able to figure out the exact weight limit, but I placed two 5 pound weights on the shelf and it held that weight. "What are the height and width and total dimensions?" This cabinet measures approximately 23 inches wide x 12.25 inches deep x 48.25 inches high. "What are the dimensions of the lower portion of the cabinet? Is the shelf adjustable on the lower portion of the cabinet? Thanks"
No shelf on the very botton. It was able to hold extra toilet paper that I purchase but not more than that. The only shelf's that are adjustable are in the main cabinet. "When are you going to replenish your stock for Simple Living Tall Cabinets in all colors?" The black, red, and antique white will be in stock by early of May. "do you ship to mexico??" The cabinet does not ship to Mexico. "I had my heart set and was about ready to purchase the red color Simple Home Tall Cabinet ON SALE tonight ! I even received an email that said item was back in stock. By the time my computer tablet got to item , it said 'this item sold out'. 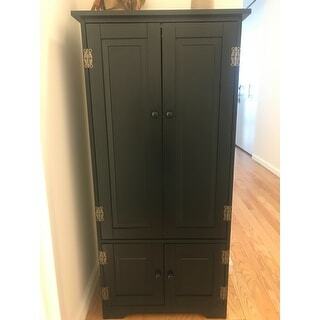 It is the only type cabinet that will fit, suit me perfectly for purposes and I love the look / will match my decor. I submitted the request to again be notified via my email when this item is back in stock. * Will I still be able to buy at the sale price ( semi-annual sale) where I found this item and decided to buy ? If price goes up I'm afraid I cannot afford. Please re. I was so happy while I was in process of ordering, BuT then VERY disappointed that I couldn't place into my shopping cart and buy tonight :-(."